Acrylonitrile butadiene styrene (ABS) is an amorphous polymer made by emulsion or mass polymerization of acrylonitrile and styrene in the presence of polybutadiene. The most important ABS properties are impact resistance and toughness. Among major ABS (acrylonitrile butadiene styrene) producers are Trinseo, LG Chem, Chi-Mei and Styrolution. Most of ABS producers generally use emulsion polymerisation but Trinseo uses mass polymerisation. Styrene monomer gives the ABS good processability, acrylonitrile provides stiffness, heat and chemical resistance while butadiene makes the product more tough and resilient even in low temperatures. Changing the proportions of ABS components and adding specific additives can produce different grades with specific properties. ABS has poor weather resistance and therefore it is recommended for interior applications only. Acrylonitrile butadiene styrene can be generally used within a temperature range from -20°C to +80°C. ABS is resistant to aqueous acids, alkalis, concentrated hydrochloric and phosphoric acids, alcohols and animal, vegetable and mineral oils but is attacked by concentrated sulphuric and nitric acids. 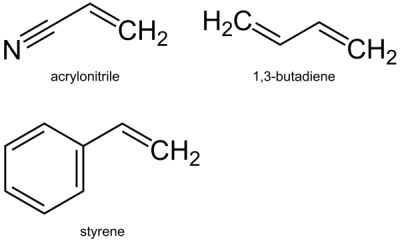 Acrylonitrile butadiene styrene (ABS) is soluble in esters, ketones, ethylene dichloride or acetone. ABS can be processed by the injection or extrusion moulding process.